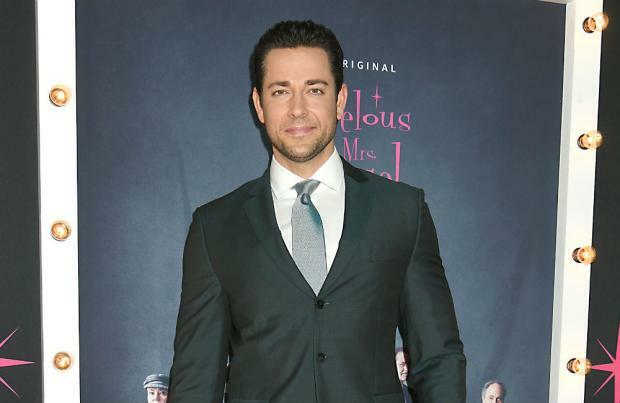 Zachary Levi "always dreamed" to be given a role where he gets "paid" to get in the best physical shape of his "life"
Zachary Levi "always dreamed" of being given a role where he gets "paid" to get in the best physical shape of his "life". The 38-year-old actor – who is set to play the titular role in the upcoming DC and Warner Bros superhero flick 'Shazam!' – has a new found respect for Dwayne 'The Rock' Johnson and the "incredible" workout regime he sticks to when working, and hopes one day he can be on that same "level", despite being the "strongest" he's ever been. Speaking to Collider about The Rock's fitness routine, he said: "I still don't know. It takes a village I'll say that, and he's got an incredible village around him to be able to stay on that schedule because even with everything that I'm doing, I'm still not able to reach 'The Rock' level, but maybe one day! "I hope I'm able to continue in this journey that I'm on right now of strength and wellness and health and the happiness that its brought from that and just transforming my body and being stronger than I've ever been. "I always dreamed that I'd get paid to be in the best shape of my life and that's essentially happening so I'm happy about it." Levi's DC alter-ego has been brought to life with a red suit, which features an iconic red cape and gold lightning bolt across the chest, however, the star admitted that if there was going to be a sequel, he'd want to make a few "adjustments" on the outfit to make it more "comfortable". He added: "I'd want to make some adjustments on the suit just to make it a little more comfortable, the suit's amazing and it's beautiful and lights up and everything, but I was freezing, we shot in Toronto in the middle of winter and it didn't keep me warm at all and then we'd go on the stage inside and I'd be burning up. I want to work with wardrobe designers and find a happy medium!"